Random Anny .Com: Well Mad Men ended but would I recommend it? Well Mad Men ended but would I recommend it? So Mad Men ended last night - the same way it played out for all these years - with snippets of quiet desperation. I garage saled my first season of Mad Men six years ago, couldn't eBay it and finally sent it to swapadvd the next year. I didn't have any desire to watch it until years after that when I finally binge watched in Netflix. You know what? I liked it. It was gloomy, slow paced, no one was ever happy and even when they were successfully making money everyone was two drinks away from ruining their lives. I kept hoping things would get better. I kept expecting exciting new developments but it mimicked real life with a slow pace. In the end I was left with a hollow feeling - I'd watched a charismatic, depressed man from yester-year float through seven years. He was the main character so everyone else's genuine feelings were a desaturated background. 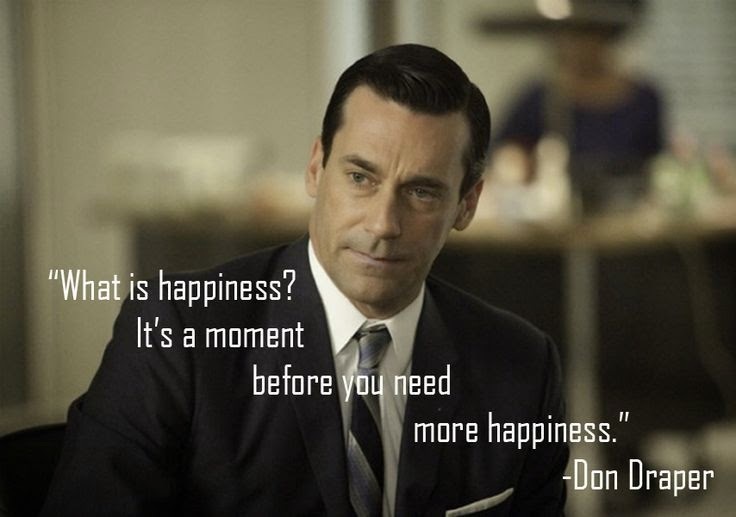 So now we have Mad Men in its totality - encapsulated - complete. Don Draper's actor went off to rehab. I wouldn't recommend this show to someone who'd never watched it. Sure, feel free to watch it if you love vintage decor or are pretty bummed about life. Mad Men and a lot of ice cream would probably assuage a broken heart. In a frozen winter when everyone is snowed in this would make an appropriate backdrop.